1 – If Newcastle United are having a run of good form, then a good player will get a serious injury. 2 – In school, some kid will always ignore the chemistry teacher and inhale a chemical they shouldn’t. Every term. Without fail. In my school it was the same kid who had already burned a hole through his clothes with a lump of magnesium. 3 – Arch-populist Vince Cable, in any given policy area, will have made completely opposing statements just to cover his bases. Whenever the Tories are in Government, Europe will be front-page news before long. And so it came to pass. Cameron jets off to his first summit of European leaders and already there’s a furore – yes I used the word furore – over an increase to the EU’s central budget. This is always interesting because the Tories are permanently split on how to deal with Europe. Now it’s more interesting because we have the added bonus of a potential area of disagreement between the Tories and the Lib Dems, their submissive slaves, human shields, partners in the coalition Government. The right-wing of the Tory party are already vocalizing their displeasure at Cameron’s failure to prevent an increase in the UK contribution to the EU budget. France and Germany went into these talks wanting revisions to the Lisbon Treaty to create a permanent process to ensure that Eurozone countries are bailed out, as Greece was, in any future financial meltdown. On top of that, the European Parliament wanted a 6% increase in the contributions from member countries. Cameron should have dealt with these issues over the last few months but appears to have left it all too late. He’s now got William Hague and the rest of the cabinet spinning the story that Cameron did great work in getting the budget increase limited to 2.9%. Which is, of course, nonsense. At a time when Britain is cutting spending across all departments, the right political move would have been being seen to campaign for a complete freeze in budget increases. Despite that 400 million pounds isn’t a great chunk compared to the 155 thousand million pounds of the deficit, the principle stands. That’s £400 million that could have been spent in schools, hospitals, transport infrastructure, or policing. Dave may have been comfortable campaigning through the general election as a eurosceptic, but as with most Prime Ministers, he’s finding that stance a lot harder in the world of realpolitik. Instead, he’s ended up taking a moderate line in the limited negotiations he’s attempted. He may now be realising just how difficult it is to make demands in Europe when your only allies are the far-right fascist minority. Now he has to deal with the right of his own party. Remember Cameron’s cast-iron guarantee? The promise that if Cameron became PM, a Conservative government will hold a referendum on any EU treaty that emerges from negotiations, and that no treaty should be ratified without consulting the British people in a referendum. 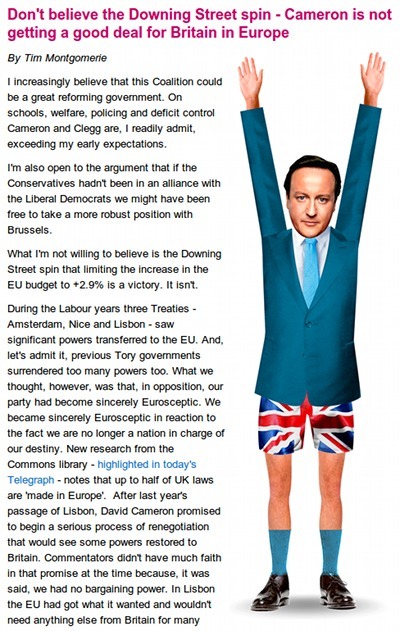 The eurosceptics of his party haven’t forgotten. And now the naturally right-wing grassroots, and indeed backbenches, are going to make their voices heard like they do in the photo taken from here at Conservative Home. Let’s see how Cameron deals with that. More spin I suspect.